A three-month-long investigation by NBC Bay Area found several solutions to manage California’s drought, even without more rainfall, but experts say it’s a matter of putting those technologies to good use and streamlining government regulations and financial incentives in order to encourage people to use them. Despite the expectation of record rainfall from El Niño in the winter of 2015-2016, experts predict California will remain in a drought well into the fall of 2016. For that reason, California Gov. Jerry Brown extended his executive order calling on mandatory conservation measures, which sent a strong signal that the governor is not banking on a strong El Niño to undo the damage done by four years of drought. NBC Bay Area’s Investigation found a consensus of experts who say California cannot conserve its way out of the water crisis, with climate change expected to cause prolonged future dry spells and possibly wipe out or severely diminish the Sierra snowpack, one of the three main sources of water for the state. Scientists say the data shows that four years of drought has already depleted underground aquifers to dangerously low levels in some places. NBC Bay Area talked to more than 75 different experts, policymakers, scientists and researchers about new technologies and solutions to solving a water crisis on a large, regional scale. As part of that investigation, NBC Bay Area’s Investigative Unit also traveled to Israel to see firsthand detailed solutions that could be applied in California. Some of the techniques the Israelis used on a large scale are now beginning to gain a foothold in California. The expanded reuse of treated wastewater is one of the most important solutions that California can capitalize on, according to dozens of expert who talked to NBC Bay Area. According to both California’s Water Resources Control Board and the independent, non-partisan Milken Institute of Jerusalem think tank, only about 7 percent of wastewater is reused in California. Scientists say hundreds of millions of gallons of treated wastewater are dumped into the ocean every day from California. While Gov. Brown issued an executive order that would fast-track permitting for water recycling facilities, and the $7.5 billion water bond calls for increased investment in the technology, the experts say California has a long way to go to catch up to a country like Israel. Israel recycles about 85 percent of all its water, sometimes for a second or third time. In addition, 60 percent of all crops in Israel are irrigated with recycled urban wastewater. 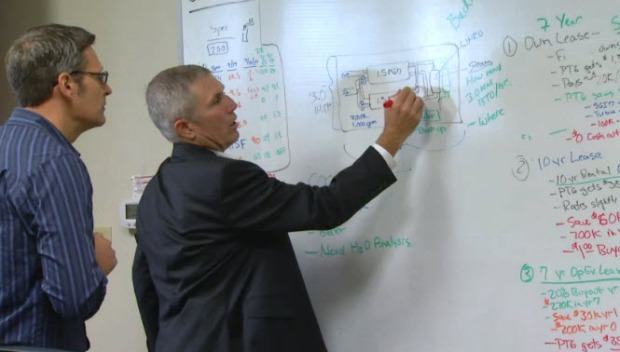 Stephen Stock talks with the CEO of Pasteurization Technology Group regarding techniques to treat waste water. 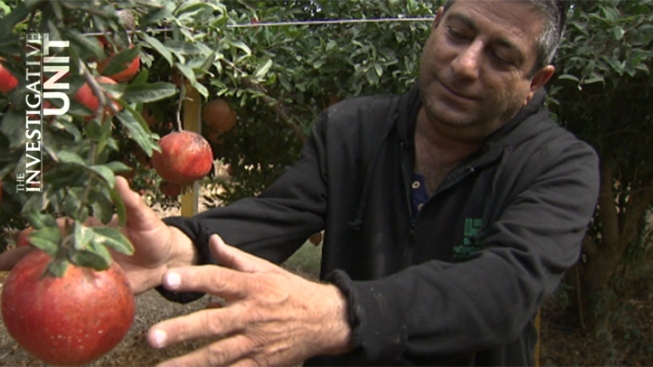 Yigal Aftabi is an Israeli farmer with acres of red pomegranates growing in the Negev desert. Aftabi said nothing used to grow on the land he now farms because only a few years ago there wasn’t enough water. But since the country began a massive undertaking to recycle almost every drop of water and use it to irrigate crops, such as his pomegranates, he said a lack of rain doesn’t keep him up at night. Agriculture is just one of many ways California can reap the benefits of recycled water, according to the experts who talked to NBC Bay Area. 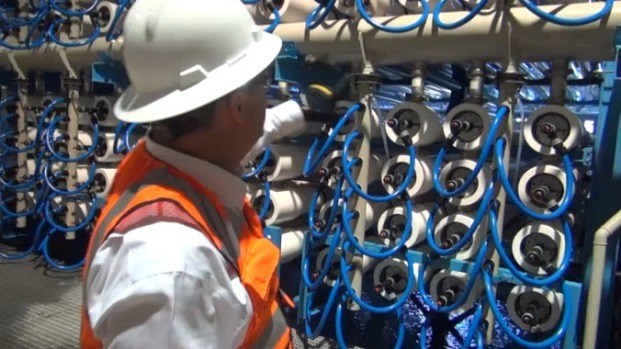 Recycled water can also be used to recharge the state’s dwindling underground aquifers. Orange County is already doing just that. Experts point to Orange County as a model for the reuse of water that other municipal water districts should emulate. Further in the future, those experts say, is the potential for direct potable reuse, also known as toilet-to-tap, where wastewater is treated and introduced directly into the public water system. Singapore has used this method of wastewater recycling successfully, and Texas recently built the first of this type of recycling facility of its kind in the United States. San Francisco’s Public Utilities Commission has recently adopted an ordinance that requires property owners to install recycled water systems in new large construction projects. Aaron Tartakovsky is a San Francisco entrepreneur who created a company called Epic CleanTec that is trying to step into the opportunity created by the city’s new ordinance. The company is in the testing phase of a new on-site treatment technology that converts wastewater solids into a dry, odorless, organically-based bio solid that’s contained within a single building. Once the solids are removed, the separated water can be treated for reuse in toilet flushing or irrigation. Tartakovsky said the SFPUC has been nothing but helpful when working with his company, but on a larger scale, he said California has room for improvement when it comes to reusing water. Another solution to mitigate a lack of rain is drip irrigation. Developed on an Israeli kibbutz, or collective farm, 50 years ago, drip irrigation is quite literally the opposite of flood irrigation, the most common form of irrigation worldwide due to the fact that it’s cheap and easy. Flood irrigation simply requires a pipe to be opened, sending a torrent of water gushing into the field. Drip irrigation, on the other hand, relies on precision emitters placed alongside each plant. 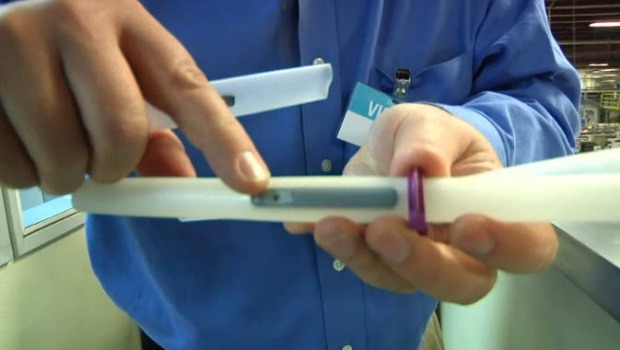 The emitters are engineered to water the plant’s root zone one drop of water at a time. Studies show it’s more efficient than flood irrigation and actually substantially increases yields of most crops. Stephen Stocks examines the technology that Netafim uses to drip irrigate crops. Netafim, the Israeli company that pioneered drip irrigation, opened up a Fresno office in 1996. The company’s USA Division CEO John Vikupitz says California farmers have become more conscious of the technology over the last decade. “I think that farmers in California in particular, and other parts of the country as well, deserve a lot more credit than they’re given for the adoption of technologies,” Vikupitz said. In Israel, drip irrigation is used on about 75 percent of crops, according to the Milken Innovation Center at the Jerusalem Institute for Israel Studies. In California, only about 40 percent of crops are watered with drip systems. Those farmers who use drip irrigation in the Central Valley tell NBC Bay Area they’ve been successful using it on a wide variety of crops. Just down the road from Netafim’s Fresno office is one of those young farmers Vikupitz was talking about. Seth Rossow is an alfalfa grower with an MBA from Fresno State. He’s been using drip irrigation for about five years. Not only because it saves water, he says, but because it makes him more money. “We’ve increased our yield so much that if you start actually calculating the dry matter pounds per drop of water, we’ve increased 62.5 percent of our crop per drop of water,” Rossow said. Rossow said farmers want to conserve water, but they’re also running a business, and they need incentives if they’re going to invest the money for a new irrigation system. He says the increased yield definitely provides an incentive, but he’d like to see an easier and more streamlined process when it comes to applying for government grants. But, even as the situation exists today, Rossow said drip irrigation is spreading quickly. Then there is the process of desalination, or the process of reverse osmosis that cleans salty ocean water and creates fresh drinking water. Experts agree that desalination is the most energy intensive and expensive source of fresh water that also carries some environmental consequences due to the salty brine wastewater that’s left over from the process. Critics of desalination say the briny wastewater can have negative impacts on marine life when it’s discharged back into the ocean. But every expert NBC Bay Area talked to about drought solutions agreed that desalination is the only truly drought-proof source of water. As for critics of the process, desalination experts say new technology has made the process more energy efficient. And engineers have developed ways to mitigate the briny wastewater and dilute it during the desalination process to make it more environmentally friendly. About 10 years ago, Israeli policymakers were forced into adopting desalination technology out of necessity during the country’ water crisis. Faced with the possibility of running out of water, the Israeli government ordered the construction of large-scale desalination plants that are now responsible for providing the a little more than half of the country’s drinking water. The plants are run by a company called IDE Technologies. California isn’t as dry as Israel, which is why experts say the state won’t have to rely on desalination to the extent Israelis do. Israel also has the benefit of its smaller size, compared to California, meaning the expensive pipes that deliver water from desalination plants don’t have to be as long. But many of those same experts say desalination will play an important role in the future water security of California, especially in the dry, coastal areas of Southern California. In fact, the largest desalination plant in the Western Hemisphere recently went online in Carlsbad, built in part and operated by IDE Technologies. Experts also say that water pipe infrastructure already currently in the ground in places such as the Bay Area would serve desalination plants if they were built in those areas in the future. Stephen Stock tours IDE's desalination plant located in San Diego, learning about methods to convert sea water into drinking water. For places like San Diego, which experts say is at the end of a lot of dry pipes, the added cost is well worth the drought-proof security blanket desalination provides. Lambert said the City of Santa Barbara recently reached an agreement to upgrade their 25-year-old desalination plant because they’re fearful of a prolonged drought. Orange County is also contemplating building a desalination project. The Carlsbad plant took more than 15 years to build because of the extensive permitting process. Lambert said he hopes, once people see how the plant can safely and cost-effectively deliver fresh water from the ocean, the permitting process will become more streamlined for future projects. In fact, five Bay Area water agencies are investigating whether a desalination plant could be built in eastern Contra Costa County that would turn brackish water into drinking water. While nothing formal has been decided and no firm plans have been made, some of the state’s largest and most progressive water agencies are involved in discussions about the possibility of building such a plant. Included in those discussions are East Bay Municipal Utility District (EBMUD), the San Francisco Public Utilities Commission (SFPUC) and the Santa Clara Valley Water District (SCVWD). Richard Sykes, director of Water and Natural Resources for EBMUD, used Australia, which turned to desalination during the Millennium Drought, as an example of why California should consider adding desalination to its water portfolio, even though that country’s desalination plants are not currently pumping out lots of water.